When your young boy needs to poo during parents wedding. You can plan everything for your wedding except this…..
Hannah and Ben Lienert’s big day was planned right to the last detail. The right dress, a beautiful Barossa location, the flowers, the music. Even the weather turned on the goods for the day. But some things you can’t control. Hannah and Ben Lienert about to be married. And when you are three-years old and you need to go well, you gotta go don’t you? 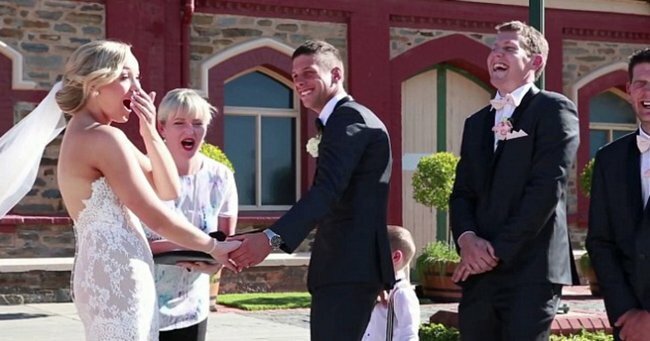 At their recent wedding just as the happy couple stared lovingly into each others eyes, holding hands, about to embark on their vows, they were thumpingly brought back to reality by their three-year old son. “When thinking people conclude what are the real values in life and come back to decide what really matters….” the celebrant read as little Hunter made his way around to his dad’s back and tugged on his coattail. “I need to poo,” he screamed. As the crowd laughed and his mother looked astonished, Hunter’s auntie swept into action, hustling Hunter off to attend to his business. Hannah and Ben Lienert with their now-not-needing to poo son Hunter and their baby. Via Seven News. 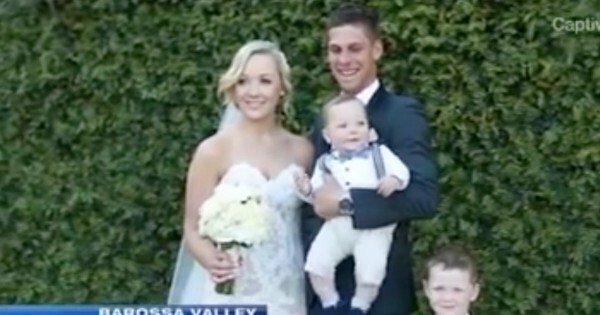 “That is the definition of being upstaged I reckon,” the celebrant says before getting back to the other business of marrying Hunter’s mum and dad. “I had planned this wedding to a T and everything was perfect, and I learned that children are unpredictable and the best laid plans don’t often work” Mrs Lienert told The Eyre Tribune. 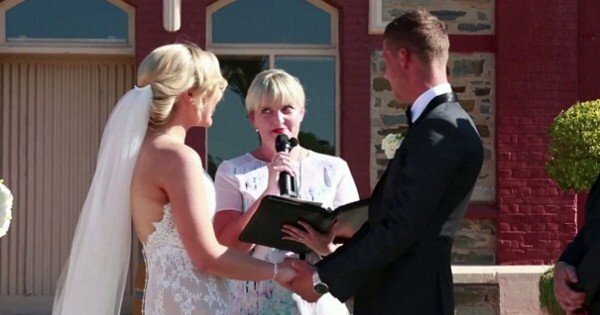 She uploaded her unusual wedding video to YouTube with the caption: “Children and weddings don’t always mix, but they sure know how to make them memorable”.